The Syriac Orthodox Church, one of the oldest churches in the world and seated in the heart of war-ravaged Syria, has selected a US-based archbishop as its next patriarch. Mor Ignatius Aphrem II Karim, a native of Syria, has been Metropolitan and Patriarchal Vicar to the Archdiocese of the Syriac Orthodox Church for the Eastern United States, based in New Jersey, since 1996. He was elevated Monday, March 31 during a private meeting of church archbishops in Beirut, Lebanon, following the March 21 death of Patriarch Zakka II. Karim now takes up the challenge of leading a worldwide diaspora of Syriacs and a dwindling flock in Syria, where Christians have been targeted by Islamist insurgents who consider them allies of the government. He will take up his seat at the head of the church in Damascus. The Syrian Orthodox Church of Antioch, as it is formally known, is comparatively small but has deep symbolic importance as the world’s most ancient Christian church. Today it remains a significant part of the dwindling Christian presence in the Middle East. Of its 3.5 million members, the largest concentration was about 800,000 in Syria, though the hostilities in the country have driven many thousands of Christians out of the country. About 80,000 adherents live in the United States. Born in Qamishly in northern Syria in 1965, Karim grew up without his father, who died shortly after his son’s birth. He was educated in Syria, Lebanon, Egypt and Ireland, and had a close relationship with the late Patriarch Zakka, as well as with the head of the Egyptian Coptic Church, Pope Shenouda III. Among his friends is Yohanna Ibrahim, the Syriac Orthodox archbishop of Aleppo, one of the two bishops who were kidnapped nearly a year ago and who remain unaccounted for. 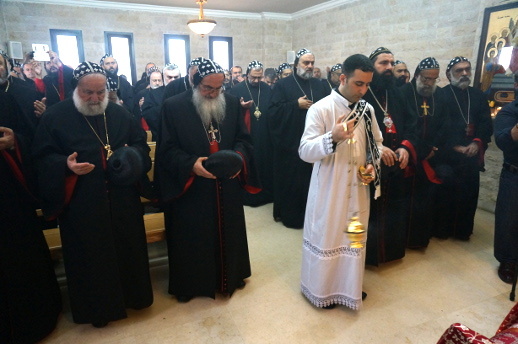 Following a week of ceremonies in Germany, Lebanon and Syria in honour of the late Patriarch Zakka, 41 of the church’s archbishops met at St. Jacob Baradeus Monastery in Atchaneh, Lebanon, to select his successor. According to church tradition, they cast their vote in writing and placed their ballots in a chalice. Karim received 23 votes.